Jul 3 Democracy triumphs in the Kingdom of Thailand. The new prime minister will be Yingluck Shinawatra, sister of exiled Thaksin Shinawatra, who was ousted by a military coup and was the hero of Red Shirt protesters and much of the rural population. Affluent urbanites disliked his reforms and higher taxes. The outgoing prime minister concedes victory to his rival – Thailand's first woman prime minister. Jul 4 While in Syria troops in the city of Hama are raiding homes and arresting people, reforms in Morocco expressed in a referendum win big – too big according to Moroccan protesters. They march and call the reforms "window dressing." They are free from government harassment but politically isolated. According to BBC News the yes vote on King Mohammed's new constitution is supported by all "main political parties, unions, civic groups [and] religious leaders." The king is to remain head of state, the military and a religious figurehead. A prime minister is to run the government and be chosen as are prime ministers in Britain, and an independent judiciary is to be reinforced. The European Union supports the changes, saying "it signals a clear commitment to democracy." King Mohammed's tolerance toward dissent appears to be working, while hatred for Syria's prevaricating dictator, Assad, remains unabated. 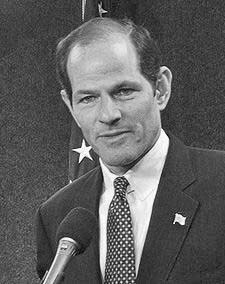 Eliot Spitzer. Search Spitzer-Bozell to watch Spitzer's interview with Media Research Center founder L. Brent Bozell III. Jul 11 Britain's phone-hacking scandal and the fall of Rupert Murdock's News of the World newspaper originates with the British public's appetite for stories about murders and tiddle-taddle – as described today by columnist Anne Applebaum in the Washington Post. It's the same appetite for the sensational that results in purchases of supermarket tabloids in the US also owned by Murdock and that influences the delivery of "news" on a variety of commercial television stations. Jul 16 Annual World Population Day occurred on the 11th with little notice. The PBS television program Need To Know mentioned it yesterday and described the decline in concern starting after the Nixon administration – Nixon having been concerned. There were businessmen and land speculators who saw profits in population increases. There were those with a religious orientation who were opposed to family planning and abortion. There were those who saw concern with population growth as directed against blacks, and there was the exaggeration in Paul Ehrlich's book Population Bomb. Europe and industrialized Asian countries have addressed the issue of population somewhat successfully. Among the industrialized powers the United States is the fastest growing – a little under 3 million more people per year. Jul 19 Time magazine reports that the research arm of the consulting firm McKinsey has compared the overall US debt with that of other countries – that is government debt, individual household debt, corporate debt and bank debt added together and compared to our GDP. The US's debt is equal to 275% of our GDP, compared to over 450% for Britain, about the same for Japan, 350% for Spain and a little above 300% for France. The US debt level is about the same as Germany's, and Germany is said to be performing well economically.